This tea pot birthday cake was a birthday cake made for a friend who absolutely loves her cups of tea. 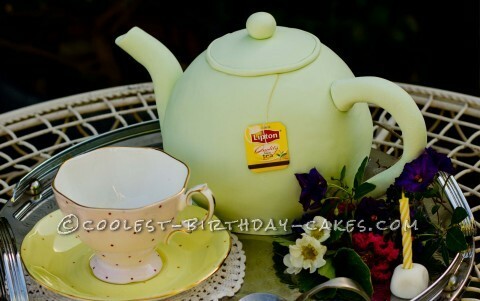 The teapot cake was shaped by baking two carrot cakes in porcelain salad bowls. The cakes were then inverted on top of each other and joined with lemon butter cream. A thick coat of white chocolate ganache was applied to the surface to provide a flat and smooth base for the fondant. The handle and spout were rolled out of fondant and a wire was inserted through before bending to provide stability, shape and to adhere the pieces to the body of the tea pot.